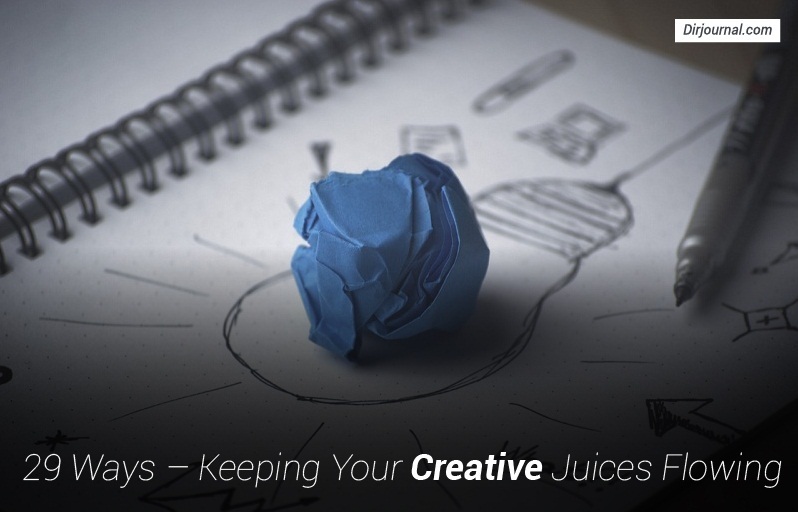 Whether you are an SEO expert, a social media marketer, a writer, or any field requiring some creative thinking, there may come a point where you need some help getting your creative juices flowing. Make Lists – Oh, look at that. This is a list, and an example of how you can create a helpful article out of a list. The visual, above, is also a list that has turned into a reusable media item that you could use, too. Also, that is where the credit goes for this list. Carry a Notebook Everywhere – If you cannot carry a notebook, at least a smartphone where you can write down ideas as they come to you. #28 references the concept of writing it down when you have a great idea. Try Free Writing – this is a useful exercise. It is a case of “anything goes” and just writing what comes to mind. If you want to participate in an organized activity, you could join nanowrimo.org where you practice free writing toward the goal of writing a novel during the month of November. It is a great way of letting yourself go. Get Away From the Computer – Even Television isn’t necessarily a bad thing if you can step away from the computer for a while and let your mind roam. Another good idea is a book or a walk in the park. Quit Beating Yourself Up – this is one for the overachievers. It is also one for the perfectionist in you. Let it go. Today is another day. So is tomorrow. Take Breaks – It has been proven that breaks actually help us to be more productive. So, don’t worry about taking that break, thinking you are losing time. You are likely to gain the time back with your rest. Drink Coffee – It doesn’t have to be coffee. If you are craving that milkshake, drink that. Whatever helps you to feel good. Listen to New Music – Try something new. It may even cause some new emotions. You may find you like the new music. You may find you do not like the new music. Either way, it has the opportunity of stimulating the creative. Be Open – This is one that sometimes we forget, but taking a step back and being open to others and other thoughts can help us to be open to new thoughts. Surround Yourself With Creative People – Which group of people would provide you with a more stimulating creative expression? Negative naysayers (unless you are writing about them) or the creative types? Get Feedback – This is especially true if you are surrounding yourself with creative people – ask them for their feedback. Collaborate – Now that you have the creative people and the feedback, trying collaborating. Don’t Give Up – It isn’t over until it is over and it isn’t over now. So, don’t give up, but keep on going. You may just need to do a couple of the items listed below. Practice, Practice, Practice – There is a saying that after 10,000 hours, you are an expert, so keep practicing what it is you love to do. If you are not already an expert, you will be after enough practice. Allow Yourself to Make Mistakes – Just because you are the expert doesn’t mean you have to be perfect. Allow yourself to be human and to make mistakes. Did you know that when drum machines first came out, musicians would actually program in “mistakes” to allow the drum track to sound more “human” instead of a machine? Think on that. Go Somewhere New – Even if it is the next block over, try a new surrounding and go somewhere you haven’t gone before today. Count Your Blessings – all of us have them. We have blessings. It could even be as simple as the sun coming up today or the pet curled up in your lap. Realize how blessed you truly are. Get Lots of Rest – Even when we think that we don’t need rest, or more accurately that we can function “just fine,” we need rest. It is amazing how much more productive we are with rest. Take Risks – take risks in your creativity (not necessarily with your safety). If you are a writer, write about something you wouldn’t normally write about any other time. The same thing if you are a painter, sculptor, orator.. Break the Rules – Along the lines of taking risks, break the rules. When I was teaching students “Design” (i.e. Advanced Photoshop), I taught them the design rules and then taught them how to break the rules. The key, in design, is not to break all of the rules to the extreme, but a little breaking of the rules here and there, with intention, helped to stir that creativity. Don’t Force It – If you feel that you need to force it, it may be time to take a break and rest and come back at the project later. Read a Page in the Dictionary – another idea is to visit Wikipedia or IMDB.com. It isn’t quite the same but can sometimes get those creative juices flowing (or at least who is married to who at what time in Hollywood history). Create a Framework – this is especially helpful when writing. Create an outline and fill in the blanks. It is similar to what I am doing here, with this list. Don’t Try to be Someone Else’s Perfect – It is bad enough when you are trying to be perfect according to your own definition for yourself. The same goes for someone else’s perfect – don’t go there. Got an Idea / Write It Down – remember that smartphone or notebook you carry with you? Now, when an idea comes to you, even during a fancy dinner, stop and write it down. Text it to yourself if that is all you have. Text it to your spouse to retrieve later. There are so many options, even napkins, to save those ideas. Have Fun – life is too short to not have fun. So, have fun with your creating and with your relaxation! Finish Something – I have talked to many creative types that finish something to the 97% and it isn’t perfect enough to finish it to 100%. Here is your opportunity to finish it! And, Ann, you are one of the people I think of when thinking of people who seem to have an unending list of creative ideas. You are really exceptional at coming up with them! Thanks, Deb. Great tips! I always write down ideas (or store them in Trello) for future reference. You never know when that bank of ideas will come in handy! I do that, too! I keep a “swipe file.” Though, I’m not sure that it is technically a swipe file.. lol. Where do you come up with your best ideas? I find that they pop into my head during family dinner. I will say something like, “That is tweetable!” and my kids are like, “No mom. Don’t!” I may not tweet it, but it turns into an article 😉 Thanks, Kristi – great tip.